This is the first of a series about the freed former slaves from the Cleage plantations in Athens Tennessee once they were free. Unless I mention that they are my relatives, they are not related by blood. Our families came off of the same plantations – those of Samuel, Alexander and David Cleage, but were not blood relatives. Isaac Turk, his wives Fanny Cleage and Malinda White and all 6 of his children were born into slavery. All of them lived to see freedom, except his first wife Malinda who died in 1857. Isaac Turk was born around 1828. He was 36 years old on February 8, 1864 when he joined the United States Colored Troops in Knoxville, Tennessee. He stood 5 feet 6 inches with a dark complexion, black eyes and black hair. His occupation was listed as “farmer”. 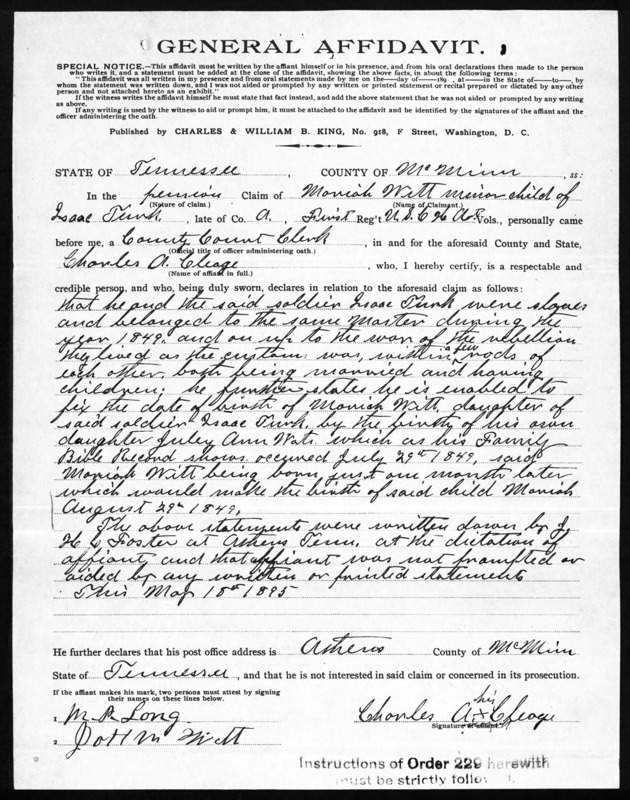 He had been a slave on David Cleage’s plantation in Athens, Tennessee. Isaac was married twice. He married Malinda White in 1844. The Rev. Samuel Hope performed the ceremony. They had five children together, William (Do not know birthdate), Mariah born in 1849, Penelope “Neppie” born 1850, Steve born 1851 and Isaac born 1852. Malinda died in 1857. After his first wife’s death, Isaac married Fanny Cleage. Rev. Henry L. Rowley performed the ceremony. 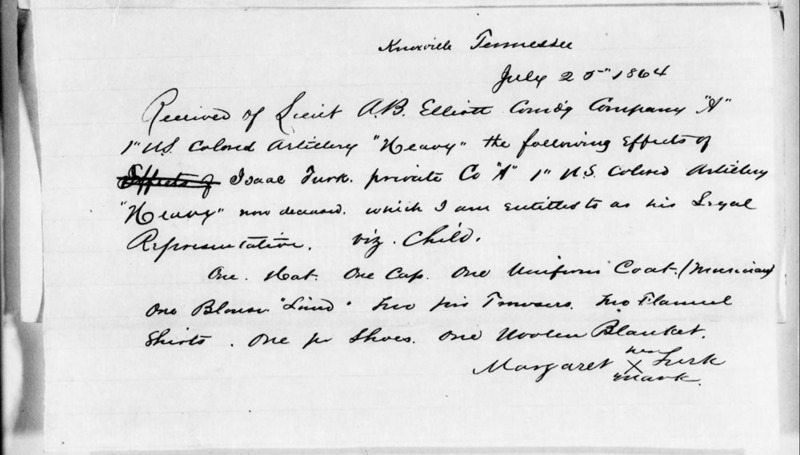 Henry Rowley was enslaved, probably by Erastus Rowley, born in Massachusetts and a professor of languages in the 1860 census, who lived down the way from David Cleage where Isaac and Fanny were enslaved. Isaac and Fanny had only one child, a daughter Margaret, born August 1859. Charlotte Bridgeman Cleage and Sarah Cleage were both present at the birth along with Dr. M.R. May, a white doctor who also lived near David Cleage. Received of Lieutenant A.B. Eliott Commanding Company A 1st US colored Artillery “Heavy” the following effects of Isaac Turk, private Co. “A” 1st U.S. Colored Artillery “Heavy” now deceased, which I am entitled to as his Legal Representative, viz. child. One hat, one cap, one uniform coat (musician) one blouse lined two pair trousers, two flannel shirts, one pr shoes, one woolen blanket. Because Isaac Turk was not going by the name Cleage, I would not have known he was a slave on David Cleage’s plantation. 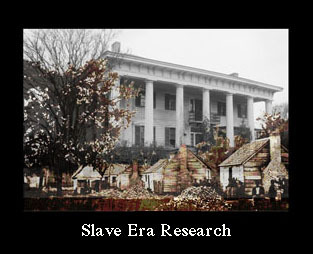 I discovered him while checking Charles A. Cleage, who I knew had been a slave on that plantation and also in the U.S. Colored Troops, in the Civil War Pension Index. There I found Fanny Cleage Turk, widow of Isaac Turk applying for her pension. In her file several people who had been enslaved on the same plantation gave testimony. 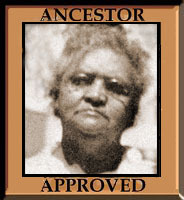 Charles A. Cleage described how he knew the birth date of Isaac Turk’s daughter Mariah, who also applied for a pension as a child. Fanny Cleage first appears in the Article of Agreement between the overseer Samuel Cleage in 1834. I was unable to find Fanny or her daughter Margaret after the hearings. Fanny and the children signed their names with an X. I was able to follow most of the other children. In the censuses, I found that his sons eventually learned to read and write, although they could not in the 1870 cesus. The women (sisters or wives) did not. The grandchildren were all literate. Turk’s sons worked as laborers. His daughters did not usually work outside of the home. 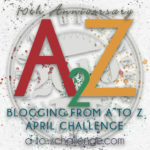 When I began looking for the Cleage freemen and women after 1865, I found several men had enlisted in Company A, U.S. 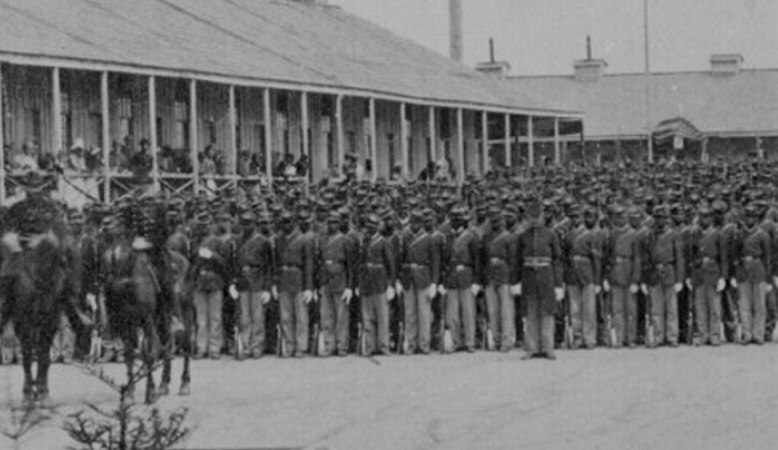 Colored Troops 1st Heavy Artillery Regiment based in Knoxville, Tennessee. Knoxville is about 60 miles from Athens, depending on which route you take. McMinn county is in the Appalachian mountain range, so it wasn’t a straight, flat walk. I have identified 7 Cleage men who enlisted. The name is spelled various ways, even within the same man’s folder. 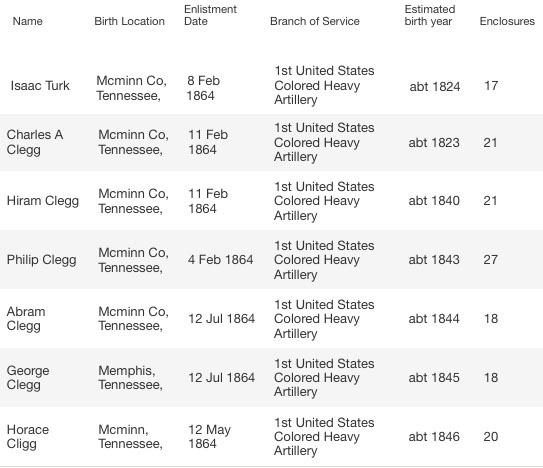 They enlisted at different times and I wish I knew the story of how they decided to leave, how they got away and how they made their way 60 mile to Knoxville to enlist. 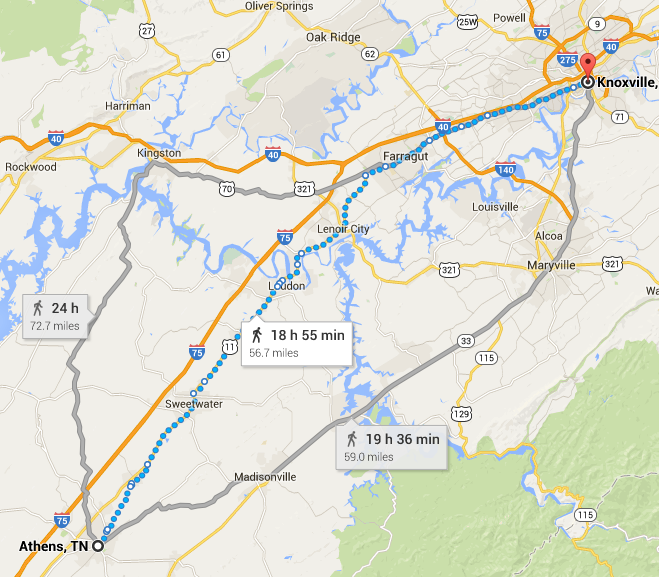 Routes from Athens to Knoxville, distance and time it would take to walk from Google Maps. I am CONTINUALLY amazed at your research skills and how often you write. The Genealogy Roadshow should hire you. Now wouldn’t that be exciting! What Kathy said. These are amazing finds. I continue to be amazed at them myself. Most of the people I will write about in this series aren’t my blood relatives, they came off of the same Cleage plantations that my family did. My family did face the same conditions though.